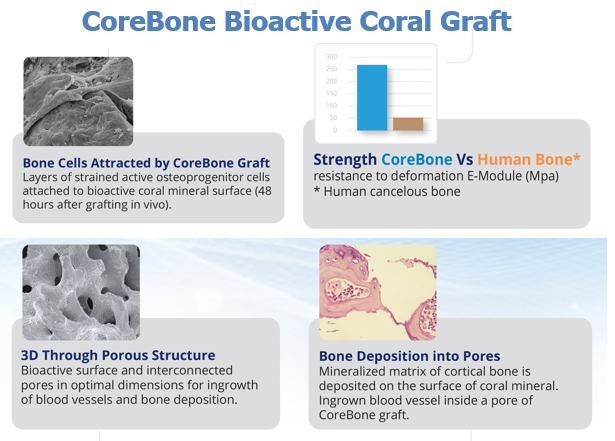 CoreBone developed and produces a bioactive coral-based bone graft – an efficient and natural alternative to current human and bovine bone derived grafts,that lead the global 4B$ orthopedic and dental markets. Interested in investing less than the minimum investment sum on this campaign? The company has allocated a number of investment units with a reduced minimum investment amount. The need to monitor the history of diseases of the "donor"
Graft materials derived from animals, especially cows and pigs, are common in the dental field. Due to the risk of transmitting resistant viruses such as mad cow, these implants undergo a high heat treatment of about c1000°, after which they lose their biological ability and become a ceramic substance that does not remodels (replaced by new bone as it grow). In the market, there are also graft materials made from synthetic materials, but they are of low strength and tend to dissolve in the body at a faster rate than the bone building itself. These are often considered the least favored solution. For these reasons, there is a strong need for a strong and effective product at a reasonable price, with properties similar to bone properties, which will enable maintaining bone volume through an efficient transition process. CoreBone answers this need with a bone-like product in terms of structure and composition, but not produced from the bone of a mammal, with all the risks included. CoreBone grafts are made from corals that are grown (cultured) in a closed, monitored laboratory environment (coral farm). 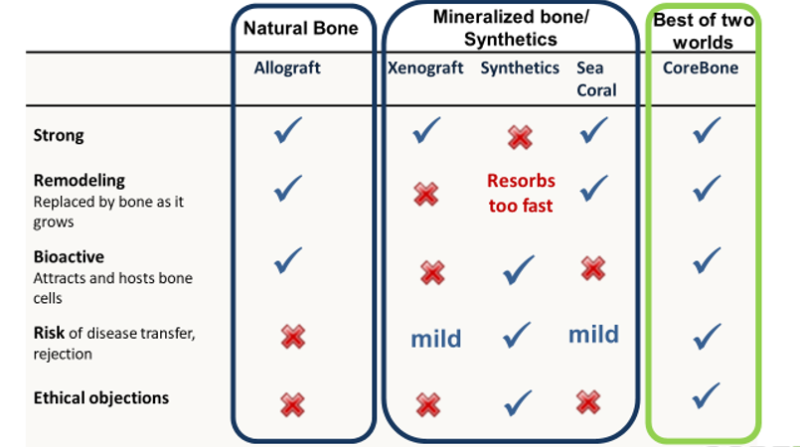 Patented technology embeds bioactive minerals (e.g., silicium) into the skeleton of selected coral types during their growth process, utilizing their bone-like qualities and adding bioactivity for accelerated bone healing and better bone connectivity. 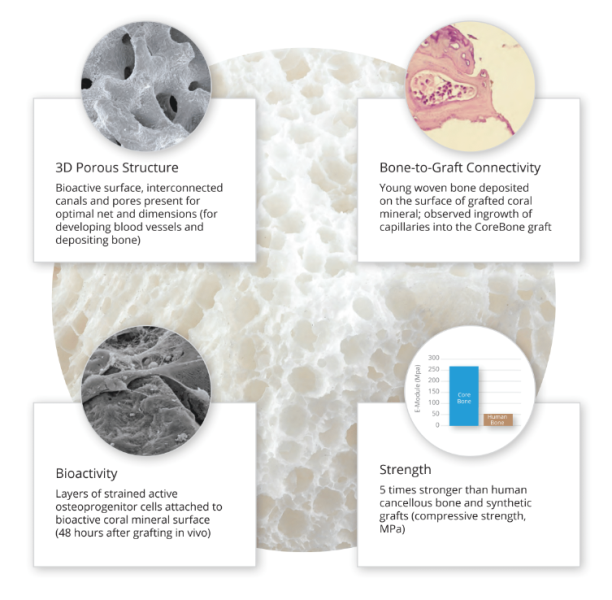 As a result, the CoreBone graft material offers the same bone-like qualities as organic material (human-derived) without the associated biological risks. This is a natural alternative to products derived from human or animal origin, with bioactive components that even encourage natural bone growth. The product is produced from corals instead of human or animal bones- and therefore does not undergo virus preventing heat treatment that damages the ability to resorb - the natural ability of the bone to grow again. CoreBone's product is a natural and safe alternative to human or animal substances. CoreBone's product is preferable for reasons of ethics, vegetarianism / veganism, and religion (Jews, Muslims, Hindus) - growing market segments. CoreBone's product price is attractive - much cheaper than leading products. CoreBone is the story of two worlds that combine in perfect synergy, behind which stands a group of wonderful staff members, each of whom is a world renowned expert in their field. The team members successfully combine their knowledge and experience in the worlds of bone research and marine biology to create a breakthrough product that revolutionizes a market with great potential. Led by its team of experts, the company has developed a coral-based bone replacement for cases of injury, disease and transplant support, which is an effective, safe and eco-friendly alternative to the leading products produced today by human or animal bones for the risks involved. In 2005, the Kyoto Protocol on Global Warming was signed, stating that the coral reefs are becoming extinct at a high rate and are expected to disappear by half a century. The convention stated that it is forbidden to harvest and trade corals. Following the convention, the CoreBone team began exploring the use of coral reefs. The team was greatly strengthened by Prof. Yitzhak Binderman, a world expert in mineralization and biology of bones, who was formerly an advisor to INTERPORE, which developed the first coral bone substitute. CoreBone's idea of growing coral for this purpose, in a closed system while controlling the quality of water and corals, has been combined with the knowledge and experience of bio-activation - improving biological abilities and bone growth encouragement - a topic that Prof. Binderman has dealt with in recent years. The project was joined by Assaf Shaham, who has been involved in coral farming at Moshav Ein Yahav in the Arava. This is how CoreBone - the only company currently growing coral as a medical product designed for transplantation - was established. CoreBone launched its products in the dental market in 2017 at the IDS exhibition in Germany, and from the beginning its unique solution has received much attention. The company began marketing its products in Israel and Poland. Initially, since the beginning of marketing, the Company focused on collecting user opinions and clinical data. These data were recently publicized in a clinical catalog published by the company, which includes a follow-up of over a year. The opinions we received were excellent and parallel to our product for the world's leading product - which originated from a cow, is not absorbed in the body (a requirement of doctors in many cases and basic conditions for the use of orthopedics). Prof. Haim Tal, head of the transplant Department at Tel Aviv University and former head of the School of Dental Medicine, joined the company as a clinical and scientific consultant. Today, the opinions we have gathered, the clinical data and the marketing material enable us to support the distributors in introducing a new product into the market, and we are prepared to expand marketing and distribution. 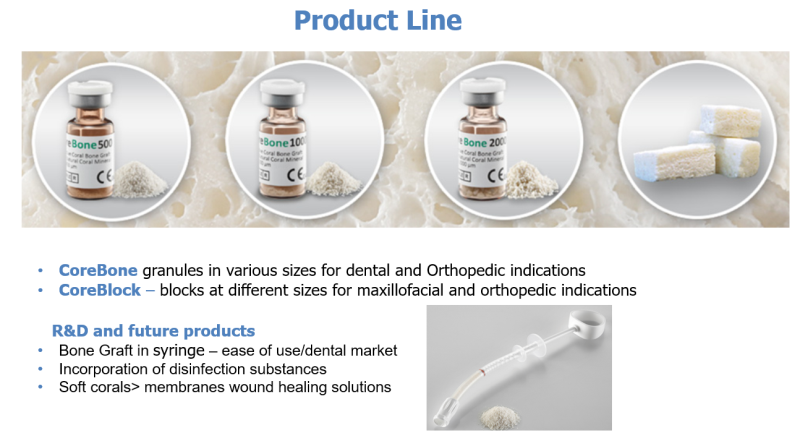 The company's goal and vision are to make CoreBone products the market leaders, both in dental use and in the orthopedic field, and continue to develop additional unique products for these markets. Ohad is an experienced entrepreneur and manager, together with Prof. Itzhak Binderman, and has run the company since its founding. Prior to that, Ohad ran several start-up companies, including VAICA, which developed a system for monitoring the use of drugs designed for third-age and chronically ill patients. In addition, Ohad co-founded ASPEC AI, which developed mobile MRI systems for use in industry (food, medicine) and agriculture. 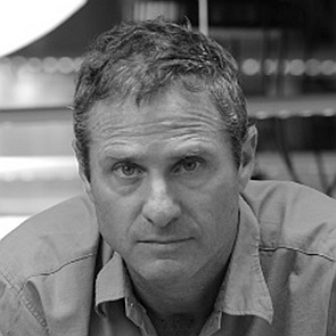 Prior to this, Ohad served as VP of International Business Development and Marketing at several leading companies such as Tami4, Finish / Teknion, etc. He has a BA in Economics and Management and an MBA from Tel Aviv University. Professor Yitzhak Binderman, a world renowned scientist in the field of mineralization and biology of bone, who initiated in collaboration CoreBone with Ohad. Professor Binderman served as Chief Technology Officer (CTO) of CoreBone until the beginning of 2017, and has since served as a consultant to the company. Prof. Binderman has been a researcher at the Weizmann Institute of Science, founded and managed the bone laboratory at Ichilov Hospital and managed the dental department at the hospital for 25 years, and was a visiting scientist at the NIH, And has served as a medical consultant to ORTHOVITA, which has developed PRO-OSTEON, which has been a leading bone substitute for many years, and currently serves as a lecturer at Tel Aviv University‘s School of Dental Medicine and Biomedical Engineering. Born in Moshav Ein Yahav, a member of the founding generation, Pepper Growers. About a decade ago, with the publication of the Kyoto Protocol and the ban on coral trade, Assaf initiated the establishment of an innovative coral farming farm as an alternative to traditional agriculture in the Arava. Assaf has experience in setting up complex lighting systems and even established the lighting system at Yad Vashem. Over the past decade, Asaf has acquired extensive knowledge and experience in the field of coral growth and is now considered a renowned expert. Since the founding of CoreBone Assaf has been engaged in coral development and production for the medical field. Today, the coral farm under his leadership is considered a leader in its field. Head of the Department of Periodontology and Oral Implants and former dean of the Tel Aviv University School of Dental Medicine.